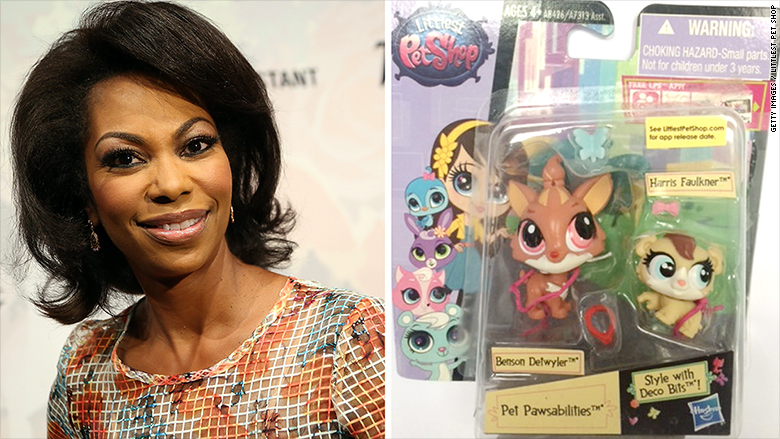 A Fox News anchor is suing toy company Hasbro (HAS) for millions after she said it appropriated her name and her likeness for its "Littlest Pet Shop" product line. Harris Faulkner filed the suit in U.S District Court Monday over the toy line's "Harris Faulkner Hamster" doll. "Hasbro's false suggestion that Faulkner endorsed its product directly impugns Faulkner's journalistic integrity, by suggesting that she has entered into a business relationship with the company (when she has not) and that she has lent her good name to a demeaning plastic rodent (when she did not)," the lawsuit said. The suit said the toy resembled her in complexion, shape of its eyes and design of its eye makeup. Faulkner, 49, was also concerned by the warning on the toy's packaging that indicates the doll is a choking hazard. "Faulkner is extremely distressed that her name has been wrongly associated with a plastic toy that is a known chocking hazard that risks harming small children," the lawsuit said. Hasbro never sought Faulkner's permission for the toy, according to the suit, nor did she give her permission for the toy. Faulkner, who serves as co-host of Outnumbered and Fox Report Weekend, is seeking $5 million in the suit. Hasbro, Faulkner and her attorney could not be reached for comment.